We explore how two landscape evolution models respond to a change in climate. The two models are developed from a divergent assumption on the efficiency of sediment transport. Despite the different resulting mathematics, both numerical models display a similar functional response to a change in precipitation. However, if we model sediment transport rather than assume it is instantaneously removed, the model responds more rapidly, with a response time similar to that observed in nature. In estuaries, mud sedimentation enhances salt marsh accretion. Here we explore system-scale effects of plants and mud on planform shape and size of estuaries. We coupled Delft3D for hydromorphodynamics with our vegetation model and ran controls for comparison. Effects are greatest at the fluvial–tidal transition, where for the first time in a model, a bedload convergence zone formed. Regardless of local vegetation effects, mud and vegetation cause gradual filling of estuaries over time. We perform dimensional analysis on a frequently used landscape evolution model (LEM). Defining characteristic scales in a novel way, we significantly simplify the LEM and develop an efficient numerical modeling approach. 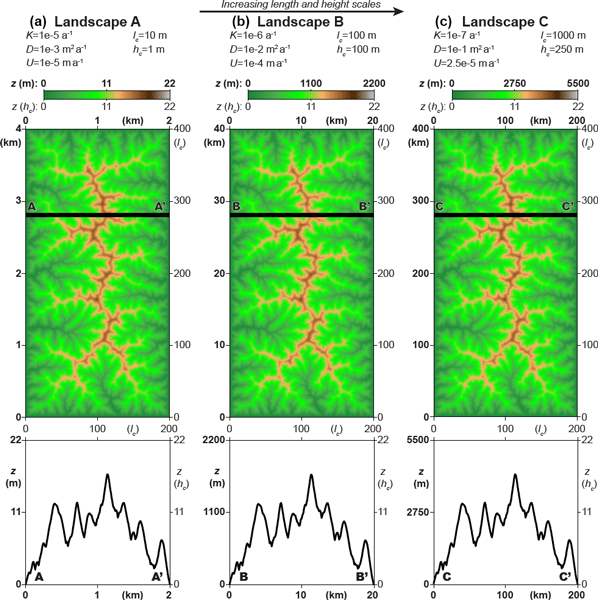 Our characteristic scales are physically meaningful; they quantify competitions between landscape-forming processes and are related to salient properties of landscape topography. Dimensional analyses of other LEMs may benefit from our approach in defining characteristic scales. 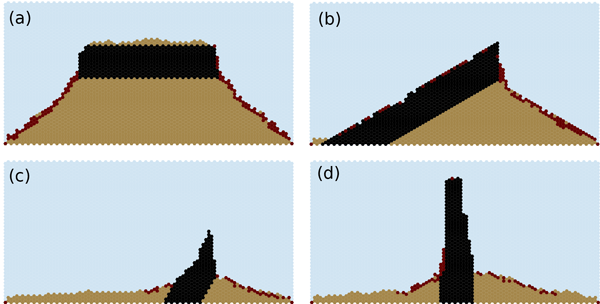 This article presents a new technique for computer simulation of slope forms. The method provides a way to study how events that disturb soil or turn rock into soil add up over time to produce landforms. The model represents a cross section of a hypothetical landform as a lattice of cells, each of which may represent air, soil, or rock. Despite its simplicity, the model does a good job of simulating a range of common of natural slope forms. Here we provide the first results on the evolution of the Ayeyarwady delta, the last unstudied megadelta of Asia. In addition to its intrinsic value as a founding study on the Holocene development of this region, we advance new ideas on the climate control of monsoonal deltas as well as describe for the first time a feedback mechanism between tectonics and tidal hydrodynamics that can explain the peculiarities of the Ayeyarwady delta. While vertical incision in bedrock rivers is widely implemented in landscape evolution models, lateral erosion is largely ignored. This makes current models unfit to explain the formation of wide bedrock valleys and strath terraces. In this study we present a fundamental advance in the representation of lateral erosion of bedrock rivers in a landscape evolution model. The model results show a scaling relationship between valley width and drainage area similar to that found in natural systems. A prevalent bedrock incision relation used in landscape evolution is the stream power incision model (SPIM), which relates incision rate to drainage area to the m power and slope to the n power. We show the most commonly used ratio, m ∕ n = 0.5, leads to scale invariance: a landscape that has a horizontal domain of 1 km × 1 km has exactly the same relief pattern as one with a 100 km × 100 km domain. This conclusion indicates that SPIM must yield unrealistic results over a wide range of conditions. 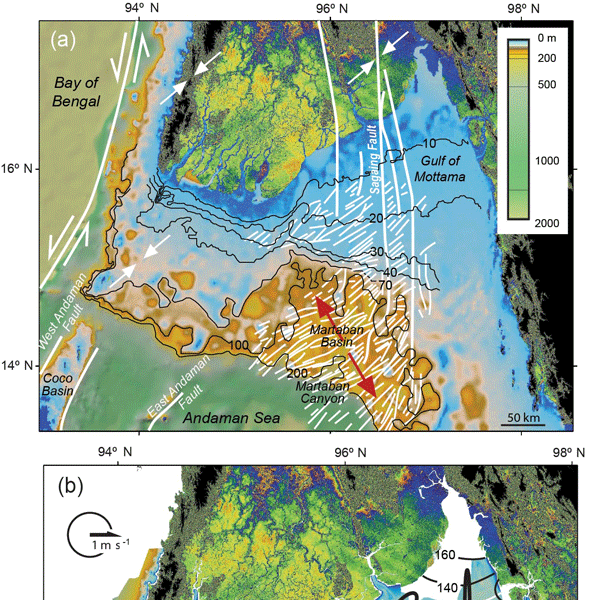 We show that in the last 3 kyr the evolution of the Chenier Plain, >200 km west of the Mississippi Delta, was influenced by changes in the position of the main river mouth, local sediment sources and sea-level rise. This information can be used to constrain future generations of numerical models to obtain more robust predictions of the effects of improved sediment management and accelerated rates of relative sea-level rise on the evolution of mud-dominated coastal environments worldwide. A double coastal alluvial fan system on Crete is used as a proxy for landscape evolution. Each juxtaposed fan records individual phases of alluvial and marine incision, providing unprecedented resolution in the formation and evolution of its landscape. The fan sequence developed during MIS 3 due to sea-level fluctuations but it was preserved due to tectonic uplift during the subsequent 20 000 years. Thus, eustasy and tectonics were important in fan evolution, but over distinct time intervals. We use geochemical approaches (10Be) on river sediments to quantify the erosion rates across the Tsangpo-Brahmaputra (TB) catchment in the eastern Himalayas. Our approach confirms the high erosion rates in the eastern Himalayan syntaxis region and we suggest that the abrasion of landslide material in the syntaxis is a key process in explaining how erosion signals are transferred to the sediment load. As technology presents a gateway to finer-resolution survey information, caution must be exercised in the evaluation of alignment error and subsequent morphological determinations. Three survey technologies were evaluated: ground-based photogrammetry, unmanned aerial vehicle photogrammetry, and ground-based lidar. Initial project planning necessitates the effective use of ground control to facilitate alignment and proper morphological conclusions. Suspension of particles in turbulent flows is one of the most widely occurring physical phenomena in nature, yet no theory predicts the sediment transport capacity of the wind, avalanches, pyroclastic flows, rivers, and estuarine or marine currents. We derive such a theory from universal turbulence characteristics and fluid and particle properties alone. It compares favourably with measurements and previous empiric formulations, making it the first process-based theory for particle suspension. The Lannemezan megafan (northern Pyrenean foreland) was abandoned during the Quaternary and subsequently incised. We use numerical models to explore possible scenarios for the evolution of this megafan. We show that autogenic processes are sufficient to explain its evolution. Climate may have played a second-order role; in contrast base-level change, tectonic activity and flexural isostatic rebound do not appear to have influenced its evolution. Despite a growing interest in landscape evolution models, accuracy assessment of the numerical methods they are based on has received little attention. We test a higher-order flux-limiting finite-volume method to simulate river incision and tectonic displacement. We show that this scheme significantly influences the evolution of simulated landscapes and the spatial and temporal variability of erosion rates. Moreover, it allows for the simulation of lateral tectonic displacement on a fixed grid. Landscape evolution models are driven by climate or precipitation data. We show that higher-resolution data lead to greater basin sediment yields (> 100 % increase) despite minimal changes in hydrological outputs. Spatially, simulations over 1000 years show finer-resolution data lead to a systematic bias of more erosion in headwater streams with more deposition in valley floors. This could have important implications for the long-term predictions of past and present landscape evolution models. Gravel threshold of motion: a state function of sediment transport disequilibrium? Accurately predicting gravel transport rates in mountain rivers is difficult because of feedbacks with channel morphology. River bed surfaces evolve during floods, influencing transport rates. I propose that the threshold of gravel motion is a state variable for channel reach evolution. I develop a new model to predict how transport thresholds evolve as a function of transport rate, and then use laboratory flume experiments to calibrate and validate the model. This paper documents that a shift from grassland to shrubland within the past few thousand years has caused erosion rates to increase more than 10-fold and drainage density to increase approximately 3-fold in areas of otherwise similar climate and geology at a study site in Arizona. We provide a mathematical model that predicts the observed drainage density under both grassland and shrubland conditions. In the model application we are able to tightly constrain every parameter. We performed the first direct numerical simulations of the process by which the pebbles transported by a river repeatedly impact its bedrock and consequently contribute to its erosion. Our results are consistent with existing experimental measurements and allow us to predict the incision rate of a river as a function of its water discharge, the amount of sediment available, and the roughness of the bedrock, which is essential to study the long-term evolution of mountain ranges. We introduce moving clasts (grains, minerals, cobbles) in a landscape evolution model. This coupling has many potential applications, such as sediment provenance or the tracing of weathered material. It fills a gap between long-term landscape dynamics, which are difficult to tackle, and sediment clast populations studied in the field. When studying long-term glacial landscape evolution one must make simplifying assumptions about the nature of glacial flow. In this study we show that for two different numerical models such simplifications are mostly unimportant in the setting of glacial landscape evolution. Following this we find that glacial erosion is most intense in the early stages of glaciation and its effects are reduced with time due to flow patterns in the ice removing areas of highest resistance to flow. Knickpoints represent localized steps along a river profile (e.g. waterfalls or rapids) that are commonly interpreted as the geomorphic response of river systems to external changes. We used a simple experiment to show that knickpoints may not only respond to external base-level change but are also able to self-organize. We highlight the effect of alluvial cover in delaying knickpoint formation and show that river bed strength controls both retreat velocity and geometry of knickpoints. An increasing number of studies demonstrates links between the intensity of periglacial processes and bedrock erosion in steep mountain landscapes. Here, we quantify the dependence of periglacial processes on temperature and sediment thickness. This allows us to model frost processes across the full range of settings encountered in mountain landscapes. We find that sediment mantle thickness strongly modulates the relation between climate and periglacial weathering and sediment transport. We incorporate relations between climate, sediment thickness and periglacial processes quantified in the accompanying paper into a landscape evolution model. This allows us to time-integrate the periglacial contribution to mountain topography on million-year time scales. It is a robust result of our simulations that periglacial processes lead to topographic smoothing. Owing to the climate dependency, this smoothing leads to formation of low-relief surfaces at altitudes controlled by temperature. We applied a spatiotemporally highly resolved dataset of discharge, sediment transport and bedrock erosion data to assess the validity of landscape evolution models at the process scale (resolution of square meters and minutes). The tools effect is found to be the dominant driver of erosion and an easy model is able to predict measured erosion. 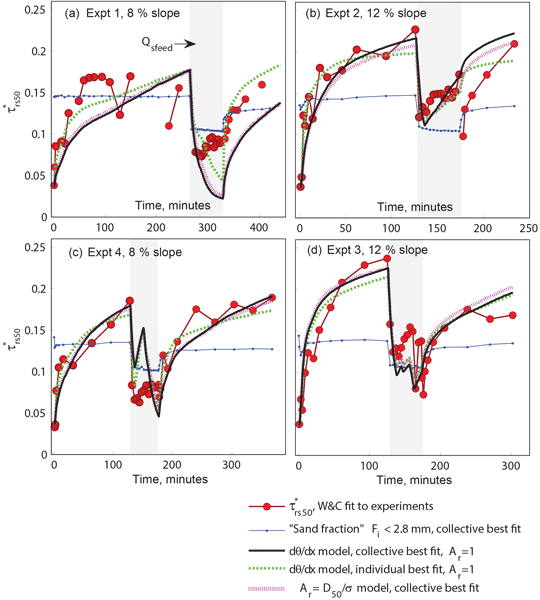 For larger scales common discharge-dependend modeling with a discharge threshold is adequate to regive the overal trend of the erosion signal. Within a landscape evolution model operating over geologic timescales, this work evaluates how different assumptions and levels of complexity for modeling glacier flow impact the pattern and amount of glacial erosion. Compared to those in colder climates, modeled glaciers in warmer and wetter climates are more sensitive to the choice of glacier flow model. Differences between landscapes evolved with different glacier flow models are intensified over multiple cycles. The saltation-abrasion model captures bedrock incision due stones striking bedrock. We present the Macro-Roughness-based Saltation-Abrasion-Alluviation (MRSAA) model, which tracks spatiotemporal variation of both bedload and alluvial thickness. It captures migrating waves of incision upstream and alluviation downstream. We apply it to incision problems not captured by saltation-abrasion, including the response to alluviation and stripping, and a simplified graben with uplift and subsidence. In this work we present DeltaRCM, a reduced-complexity model for river delta formation. It is a rule-based cellular morphodynamic model, in contrast to reductionist models based on detailed computational fluid dynamics. DeltaRCM is able to resolve channel dynamics and to produce stratigraphy. We also explain the meaning of complexity reduction, especially the essential processes to be included in modeling deltas. In this work we assess the flow-routing component (FlowRCM) of our delta formation model, DeltaRCM. 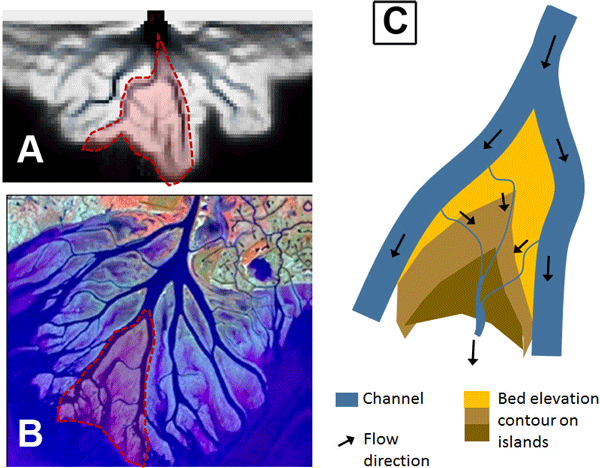 We found that with the level of complexity reduction, FlowRCM is able to produce channel network-scale hydrodynamic details, which provide further insights into the connection between delta flow structures and the morphodynamic outcome.